This past weekend, for the first time, I made beer can chicken on my grill. It turned out awesome. I loved it. This is only the 2nd time I have done a whole chicken on my grill. My "new" grill (got it back in October, so it is not really all that new) has a rotisserie motor and spit rod, which I have used once. 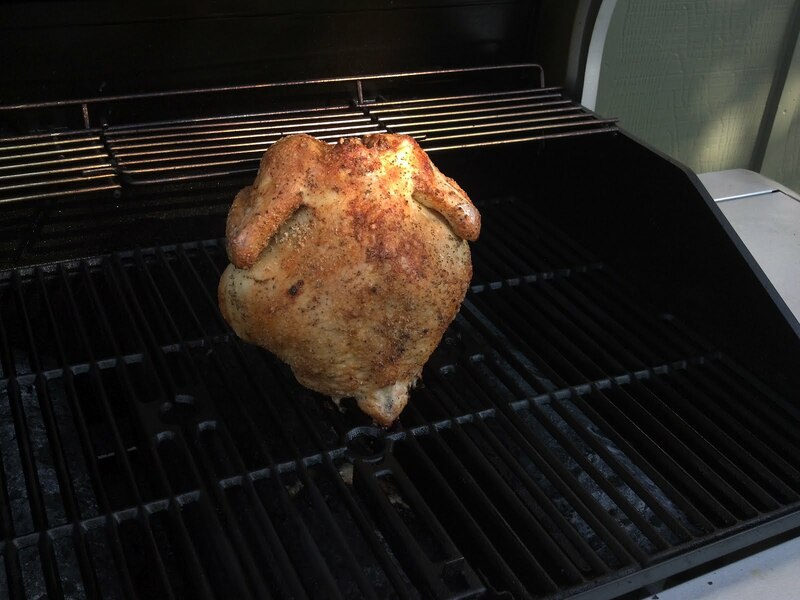 This beer can chicken blew away the rotisserie chicken that I made before. What, you may ask, is beer can chicken? Drink half a can of beer. Now, as you may imagine, there are tons of variations on just how you prepare the chicken. If you google Beer Can Chicken Recipes, you will get more ideas than you can ever actually make. At least, I will never go through and try them all. First, I asked my wife to pick up a whole chicken for the grocery store when she was there. She told me that she got the last one. It was around 5 lbs, which is a bit bigger than the birds in most of the recipes I saw. It was a nice sized bird for us, though. Then, I brined the chicken in a couple of bottles of Rocktoberfest Lager, some onion salt, and some garlic salt. I only brined for an hour or two. I think for a brine to really work, it should be longer than that, so I don't know how much this helped with flavor. Next time I will try to remember to let the brine work longer. Next, I got out a can of Boulder Beer Company's Hazed and Infused. I like this beer. It is an easy drinking, relatively low ABV beer. It is nice and hoppy without being overly bitter. 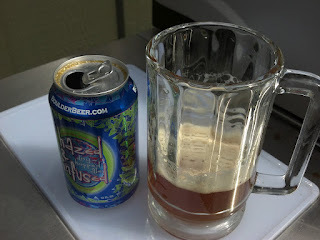 I drank half of it and let the remainder sit in the can for awhile. I took the bird out of the brine and patted it dry. I applied a rub that a co-worker had recently given me: "Fiorella's Jack Stack Barbecue KC All Purpose Rub." While doing all this, the grill was preheating to around 400 degrees. It looked much better in real life. I let it go a bit longer, then checked the temperature with a meat thermometer. The internal temperature was above 170 in every spot I put the probe, so I decided it was done. Total, I think I let the bird cook for about an hour and a half at around 375. After I took the bird out, I let it sit for awhile (10 minutes?) and then carefully took the beer can out. And how was it? Awesome. I loved it. It was so moist and juicy. The skin was perfectly golden brown and the rub tasted amazing. To be honest, I didn't perceive must of a beer flavor, but it sure was juicy. And so, my first ever attempt at Beer Can Chicken was a huge success. I am going to do this again. 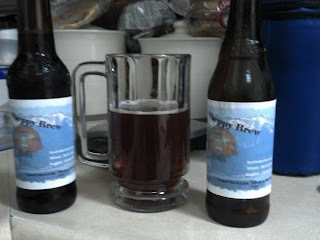 Or maybe ... next time I will make Bacon Beer Can Chicken. Just out of curiosity, with the plastic coating that is put inside beer cans these days, what happens to that coating after you heat it up to 400 degrees? Does that dissolve and get into the beer that heats up the inside of the chicken? I've heard it's better to get a stainless steel container about the same size and put beer in that and avoid getting those chemicals mixed up inside your chicken. You know... I didn't even think of that, Dave. I also did check. Of course, the can will never reach 400 degrees, the bird never got over 170 internal temperature and it insulates the can from the 375 to 400 degree oven. I don't know what temperature to start worrying about that, though. Just to be safe, I may try the stainless steel can. That way I don't feel obligated to use a canned beer. I could even just pour homebrew from my keg into the can and use that. Sweet Shep, I've always wanted to try this and once again you inspire me. I will be getting the ingredients and trying this tonight. Maybe not with such a high quality beer as you did however! Let me know how it turns out, Scott.